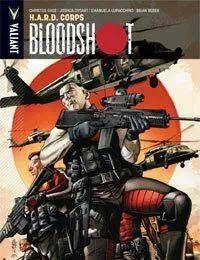 Out of the ashes of Harbinger Wars, Bloodshot is about to join the weaponized men and women of the HARBINGER ACTIVE RESISTANCE DIVISION – the black budget, technologically-augmented strike force where the powers are dangerously unstable and every mission is a one-way ticket into the meat grinder. With a reluctant leader calling the shots and a new crop of untested rookies manning the frontline, Bloodshot is about to take H.A.R.D. Corps behind enemy lines – and into a gasoline-drenched, synapse-snapping suicide run where no one is safe…and heroes always die trying.<br />Collecting BLOODSHOT AND H.A.R.D. CORPS #14-17 and BLOODSHOT #0, join acclaimed writers Christos Gage (Avengers Academy) and Joshua Dysart (Harbinger Wars) and superstar-in-the-making Emanuela Lupacchino (Archer &amp; Armstrong) right here to light the fuse on an explosive new chapter for Bloodshot and the Valiant Universe's most feared team of superhuman operatives! Also featuring the shocking origin of Bloodshot as told by Matt KIndt (Mind MGMT) and ChrisCross (Superman/Batman)!